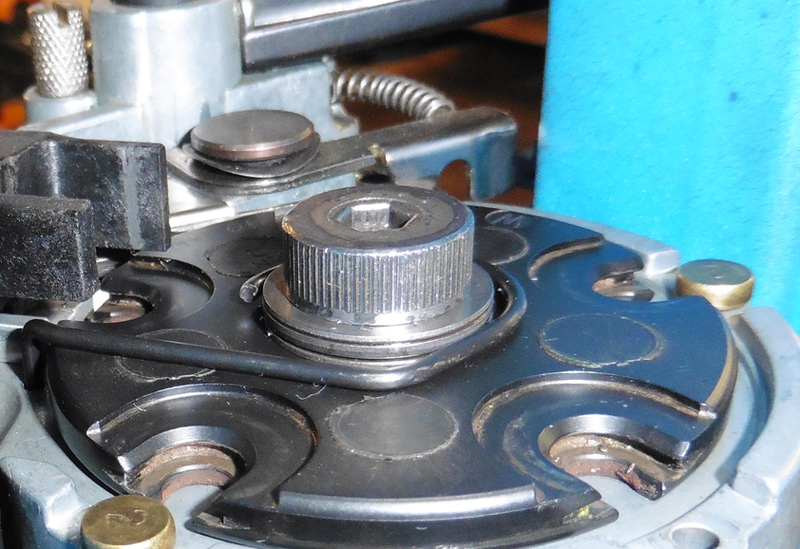 Hit Factor Shooting Supply, LLC is the Leader in Shellplate Bearing Kits for your reloading press. Here is a list of questions I get every now and then. Q: How does the bearing kit work? A: The bearing allows you to run the shellplate tighter than you would normally. In other words, the bearing helps you overcome the friction of a tighter shellplate bolt. Q: The powder knobs fit loose, will you send replacements? 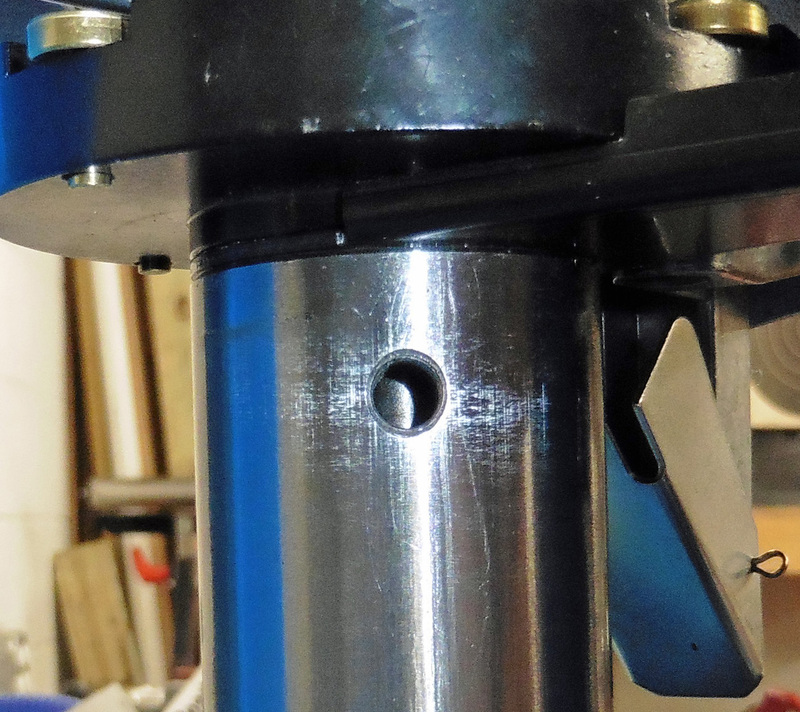 A: The plastic powder knobs will form around the hex head on the powder adjustment bar. This may take a few days. If you need a better fit right away you could try warming the ring the nuts sets in with a hair dryer to soften the plastic. Don't get carried away with the heat, it shouldn't take much. Q: Do I have to adjust my dies? A: No, the bearing goes on top of the shellplate. Q: Which lubricant should I use with the bearing? A: Mobil One grease has more buffering effect compared to oils and seems to stay put better. Just don't run it with out a lubricant. Q: The primer alarm screw doesn't fit now what? A: Dillon Precision changed the screw to a phillips head sheet metal screw, just discard the screw that came with your kit. This change seems to have occurred in late 2013. This screw will fit a Blade-Tech kydex holster (and many other brands) tension adjustment screw. Q: The powder measure screws won't stay tight, what can I do about this? A: Grind a small 45 degree angle on the washer, put the washer on the thumbscrew with the grind facing the powder measure and toward the center. The clamp is a cast part and varies a little in dimensions, you might find that the right side needs a little more ground off compared to the left side. When the washers sit flat against the clamp you will be able to tighten the powder measure screws. 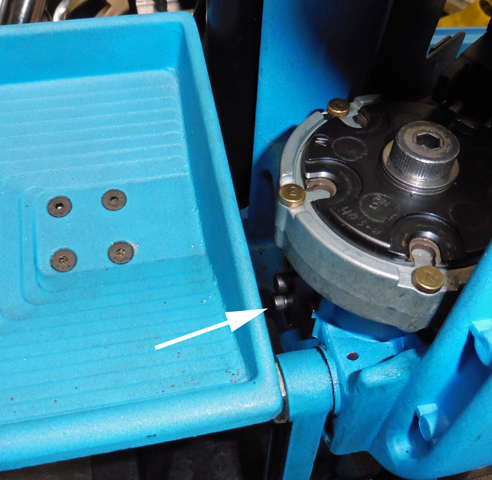 A: When our bearing kit is added to the 550 the shellplate bolt is raised about 1/8". On some presses this is enough to prevent the set screw from locking the shellplate bolt. 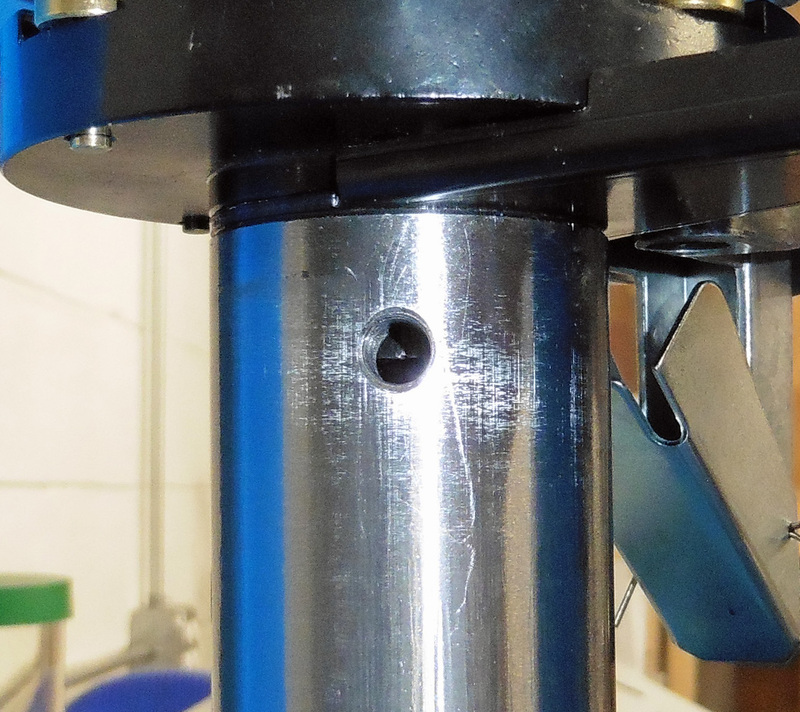 The solution is our extra length shellplate bolt, available for sale on our home page. Watch this short video to help you determine if your 450/550 needs our Extra Length Shellplate Bolt. 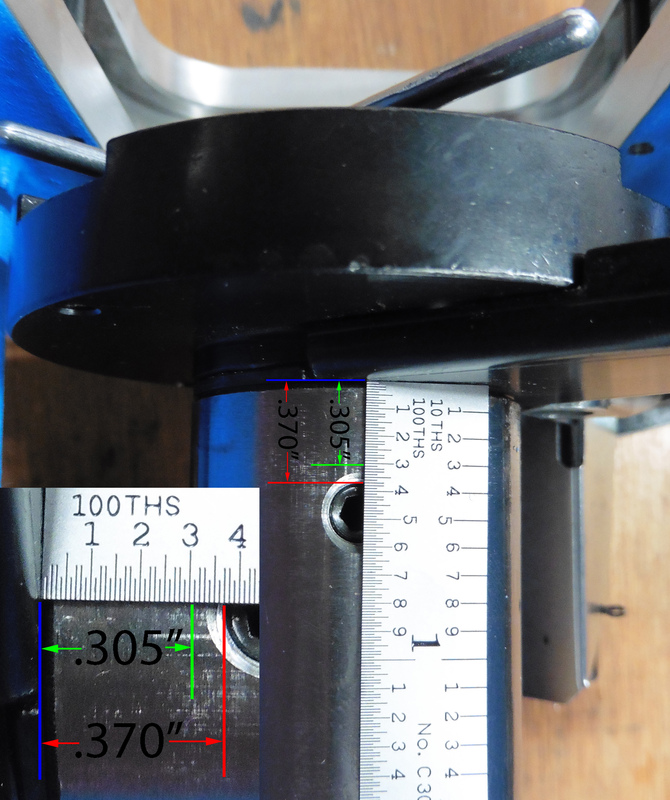 This picture shows the dimensions of the set screw location in the example pictures above. 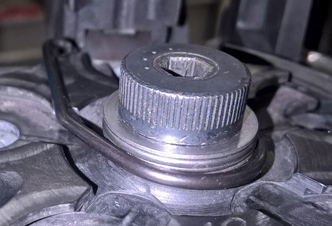 This will help you determine if you need the extra length shellplate bolt. Q: How do I adjust the indexing of my 650? A: The indexing of your 650 should be checked prior to installing any of our products. If you have a bullet tray, it needs to be removed. 1. Check the tightness of the 2 platform bolts. If the bolts are loose, the platform may be out of alignment call Dillon for help 800-762-3845. Dillon will send you an alignment tool and instructions. 2. 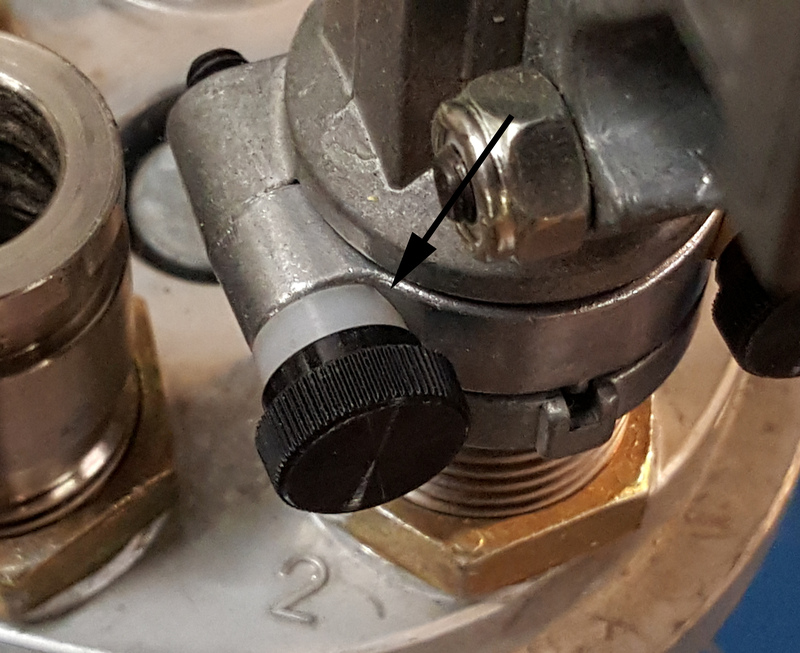 Remove the detent ball, it may interfere with the adjustment. 3. Indexer Block, don't adjust quite yet. Install the shellplate and shellplate bearing. Adjust the shellplate bearing to establish bearing preload. Cycle the press a few times. Continue cycling the press, and watch where the shellplate stops. Looking at the primer seating station, is it centered? Are cases feeding smoothly into the shellplate? 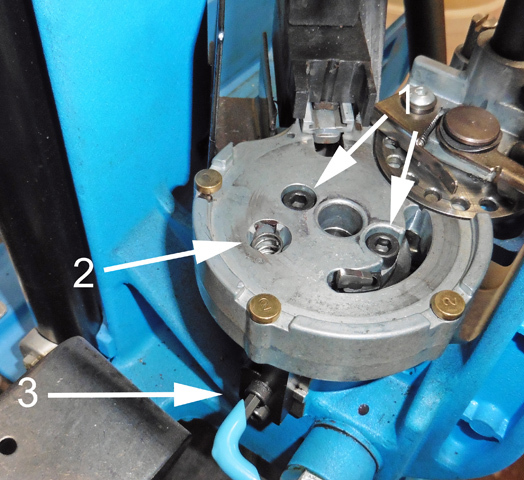 To adjust the indexer block, loosen the 2 screws. Slide the indexer block forward or backwards as necessary. Tighten the indexer block screws and cycle the press several times, adjust as needed. Install the shellplate and bearing kit. Install the bullet tray as needed. Q: Sometimes the case gets bound up on the ejector wire, whats the fix? A: This happens occasionally, some rounds seem to be more prone to it than others. Try bending the ejection wire to look like these examples. Use 2 pair of pliers and bend a small amount in several locations. This will take a couple minutes to bend a bit, test fit and bend a little more. Don't over think this. 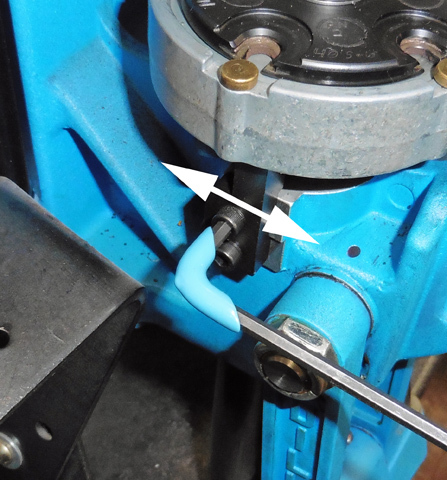 If you have to snap it into position around the bearing, it probably won't stay in place. The goal is lowering the wire and keeping it in place while reloading. Here is a short video showing one way to tune the ejector wire. Uncurl the big end about 1/8", This will make the wire longer so it will still reach the hole on the platform. 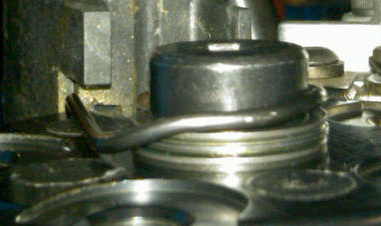 About 5/8” from the big end bend it down and that should clear the bearing stack. Then after an 1/8” bend it horizontal, the goal is to have the wire hit the case as low as possible. This technique is recommended for XL 650 presses. 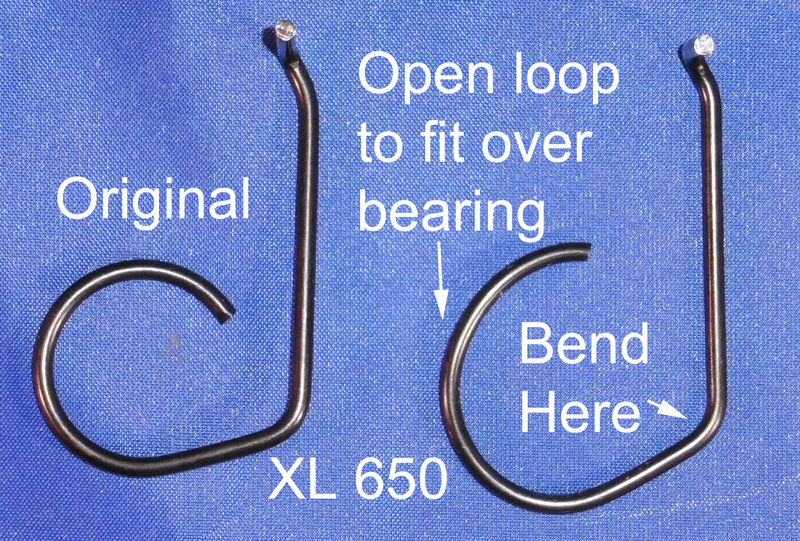 Another technique is expanding the large loop so that it fits around the bearing. Open the angle a little to make the wire longer. 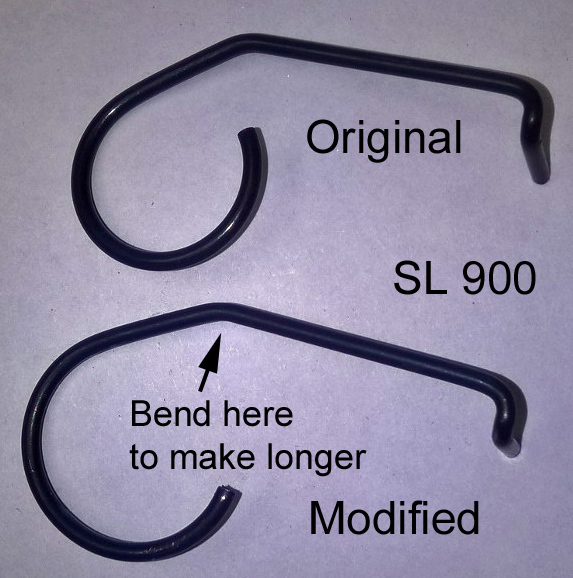 This technique is recommended for XL 650 and SL 900 presses. Method 2 picture (shown on XL 650) - this is the method we show in the video. Q: On the Super 1050 there isn't enough clearance, what should I do? A: There isn't much clearance to begin with here. Just a few Super 1050 owners have reported this problem. The solution has been thinning the 4 nylon lock tabs on the press by sanding them down with 180 grit sandpaper. Make sure all 4 screws are snug, then check for clearance again. Remove tabs and measure thikness. Sand the top of tab, take of .002" and then test fit. Repeat if necessary. to purchase machining service or a new lock ring ready to go. Q: On the older 1050 there isn't enough clearance, what should I do?. A: Send your lock ring to us to machine. We will remove the thickness of the bearing from the bottom of the lock ring. We also have new lock rings, machined and ready to ship. See our homepage at Hit Factor Shooting Supply, LLC to purchase machining service or a new lock ring. If you are not completely satisfied with your bearing kit, simply return it for a full refund. Copyright ©2019 Hit Factor Shooting Supply LLC. All Rights Reserved.